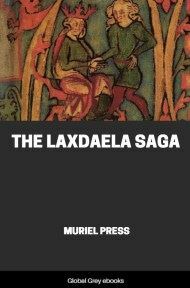 The Laxdaela Saga is one of the Icelanders' sagas. 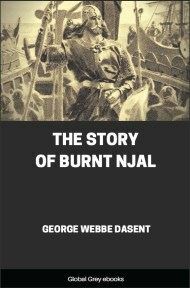 Written in the 13th century, it tells of people in the Breiðafjörður area of Iceland from the late 9th century to the early 11th century. The saga particularly focuses on a love triangle between Guðrún Ósvífrsdóttir, Kjartan Ólafsson and Bolli Þorleiksson. 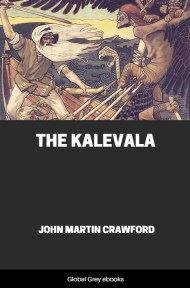 Kjartan and Bolli grow up together as close friends but the love they both have for Guðrún causes enmity between them and, in the end, their deaths. Ketill Flatnose was the name of a man. He was the son of Bjorn the Ungartered. Ketill was a mighty and high-born chieftain (hersir) in Norway. He abode in Raumsdale, within the folkland of the Raumsdale people, which lies between Southmere and Northmere. Ketill Flatnose had for wife Yngvild, daughter of Ketill Wether, who was a man of exceeding great worth. 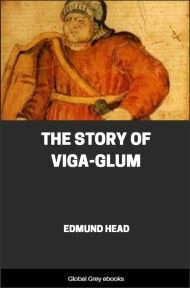 They had five children; one was named Bjorn the Eastman, and another Helgi Bjolan. Thorunn the Horned was the name of one of Ketill's daughters, who was the wife of Helgi the Lean, son of Eyvind Eastman, and Rafarta, daughter of Kjarval, the Irish king. Unn "the Deepminded" was another of Ketill's daughters, and was the wife of Olaf the White, son of Ingjald, who was son of Frodi the Valiant, who was slain by the Svertlings. Jorunn, "Men's Wit- breaker," was the name of yet another of Ketill's daughters. She was the mother of Ketill the Finn, who settled on land at Kirkby. His son was Asbjorn, father of Thorstein, father of Surt, the father of Sighvat the Speaker-at-Law. In the latter days of Ketill arose the power of King Harald the Fairhaired, in such a way that no folkland king or other great men could thrive in the land unless he alone ruled what title should be theirs. When Ketill heard that King Harald was minded to put to him the same choice as to other men of might -- namely, not only to put up with his kinsmen being left unatoned, but to be made himself a hireling to boot -- he calls together a meeting of his kinsmen, and began his speech in this wise: "You all know what dealings there have been between me and King Harald, the which there is no need of setting forth; for a greater need besets us, to wit, to take counsel as to the troubles that now are in store for us. I have true news of King Harald's enmity towards us, and to me it seems that we may abide no trust from that quarter. It seems to me that there are two choices left us, either to fly the land or to be slaughtered each in his own seat. Now, as for me, my will is rather to abide the same death that my kinsmen suffer, but I would not lead you by my wilfulness into so great a trouble, for I know the temper of my kinsmen and friends, that ye would not desert me, even though it would be some trial of manhood to follow me." Bjorn, the son of Ketill, answered: "I will make known my wishes at once. I will follow the example of noble men, and fly this land. For I deem myself no greater a man by abiding at home the thralls of King Harald, that they may chase me away from my own possessions, or that else I may have to come by utter death at their hands." At this there was made a good cheer, and they all thought it was spoken bravely. This counsel then was settled, that they should leave the country, for the sons of Ketill urged it much, and no one spoke against it. Bjorn and Helgi wished to go to Iceland, for they said they had heard many pleasing news thereof. They had been told that there was good land to be had there, and no need to pay money for it; they said there was plenty of whale and salmon and other fishing all the year round there. But Ketill said, "Into that fishing place I shall never come in my old age." So Ketill then told his mind, saying his desire was rather to go west over the sea, for there there was a chance of getting a good livelihood. He knew lands there wide about, for there he had harried far and wide. After that Ketill made a great feast, and at it he married his daughter Thorunn the Horned to Helgi the Lean, as has been said before. After that Ketill arrayed his journey west over the sea. Unn, his daughter, and many others of his relations went with him. That same summer Ketill's sons went to Iceland with Helgi, their brother-in-law. Bjorn, Ketill's son, brought his ship to the west coast of Iceland, to Broadfirth, and sailed up the firth along the southern shore, till he came to where a bay cuts into the land, and a high mountain stood on the ness on the inner side of the bay, but an island lay a little way off the land. Bjorn said that they should stay there for a while. 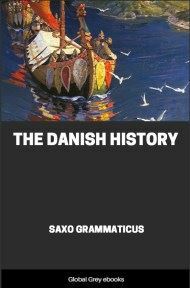 Bjorn then went on land with a few men, and wandered along the coast, and but a narrow strip of land was there between fell and foreshore. This spot he thought suitable for habitation. Bjorn found the pillars of his temple washed up in a certain creek, and he thought that showed where he ought to build his house. Afterwards Bjorn took for himself all the land between Staff-river and Lavafirth, and abode in the place that ever after was called Bjornhaven. He was called Bjorn the Eastman. 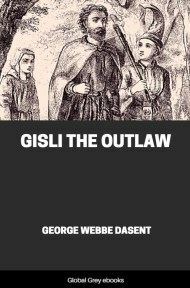 His wife, Gjaflaug, was the daughter of Kjallak the Old. Their sons were Ottar and Kjallak, whose son was Thorgrim, the father of Fight-Styr and Vermund, but the daughter of Kjallak was named Helga, who was the wife of Vestar of Eyr, son of Thorolf "Bladder-skull", who settled Eyr. 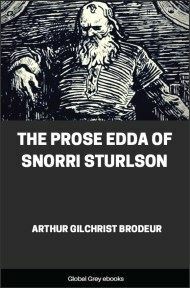 Their son was Thorlak, father of Steinthor of Eyr. Helgi Bjolan brought his ship to the south of the land, and took all Keelness, between Kollafirth and Whalefirth, and lived at Esjuberg to old age. Helgi the Lean brought his ship to the north of the land, and took Islefirth, all along between Mastness and Rowanness, and lived at Kristness. From Helgi and Thorunn all the Islefirthers are sprung.